“Your selection of courses and the material therein are right on the mark. For whatever time I’m fortunate enough to continue counseling, yours will be the provider of choice; and I will spread the word to all of my friends in the biz. 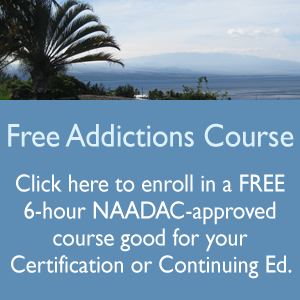 “I began my journey of substance abuse education and certification in 2006. I work for a substance abuse treatment facility who provides treatment all over the big island, my specialty is adolescents (specifically in middle and high school). I began my classes with Elizabeth in February of 06 and now here I am 4 years later, a Certified Substance Abuse Counselor. “I am am a 2007 graduate. The 270 hour course has given me a new confidence and prepared me for the challenge to accept a position as a primary counselor for last three years serving adolescents and adults in North Hawaii in an intensive outpatient facility. I feel privileged to share how this course has helped me gain the credibility I needed for a most rewarding position in the industry. Today, I continue to specialize my skills in the field as a counselor on school campus locations in Waimea and Honokaa.